The penthouse is at the top of the palace and is for maximum 10 people. There is an elevator to arrive at the top. Fully renovated, very comfortable and stylish furnishings. Sunny position. The surface of the apartment is about 110 sqm. Has 3 double rooms (double beds),2 bathrooms, one big living room with one sofabed (2 people)and one big table for 10 people, flat screen TV, Air-Conditioning, one furnished kitchen, one big terrace (100 square meters) with a big table for 8 people, there are also sunbeds. 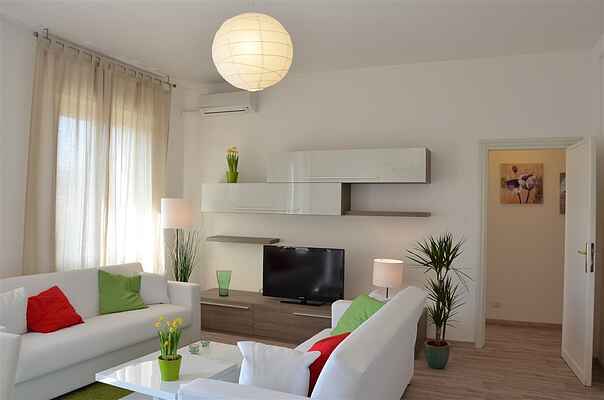 The apartment is perfect for families or couples who want to have a relaxing holiday in Rome. The location permits you to visit all the most important monuments of Rome in few minutes. The fantastic view of Rome from the terrace will help you enjoy more the city. From the terrace you can see also the head of the dome of San Pietro! Is possible to reserve a conventioned private parking very close to the apartment (150 meters). In front of the apartment (10 meters) is located one of the most popular Pizzeria in Rome (Il Peperoncino Dispettoso), with special prices for the guests of our apartment. A coffee-bar is located very close to the apartment (50 meters). The apartment is easy accessible and it is suitable to people with walking difficulties. Shop 30 m, supermarket 100 m, Pizzeria 10 m, Café 30 m, Bus stop 20 m, railway station "Balduina" 1 km, railway station "Appiano 800 m", underground station "Cipro - Linea A" 900 m.
The penthouse is at the top (fifth floor) of the palace and is for maximum 10 people. There is an elevator to arrive at the top. Has 3 double rooms (double beds),2 bathrooms, one big living room with two double sofabeds and one big table for 10 people, one furnished kitchen, one big terrace (100 square meters) with a big table, and there are also some sunbeds. The apartment is perfect for families or couples who want to have a relaxing holiday in Rome. The location permits you to visit all the most important monuments of Rome in few minutes. The fantastic view of Rome from the terrace will help you to enjoy the Eternal city! From the terrace you can see also the head of the dome of San Pietro! Is possible to reserve a conventioned private parking very close to the apartment (150 meters). In front of the apartment (10 meters) is located one of the most popular Pizzeria in Rome (Il Peperoncino Dispettoso), with special prices for the guests of our apartment. A coffee-bar is located very close to the apartment (50 meters). The flat"La Terrazza", located downtown in one of the greenest and most prestigious districts of the Eternal City, is just few minutes away fromBasilica S. Pietro, whose dome you can admire from the big terrace after which the flat was named. The flat lies on the top floor of an elegant small villa on Monte Mario, has a lift and is close to one of the most famous pizzeria in Rome. Moreover it is equipped with air-conditioning and luxury furnishing and consists of a large living room with two comfortable sofa beds, LCD television, Wi-Fi, cocktail cabinet and dining table up to ten seats. It hasthree double rooms, two bathrooms, bathtub, shower and there is also a washing machine. The dinette kitchen is fully furnished and equipped with a dishwasher and with a six-seat table. The large panoramic terrace is surrounded by century-old trees, has a big table up to twelve seats, four sun-loungers and deck-chairs and is the real attraction of the flat, where you can enjoy pleasant moments of full relax away from the chaos!